Level 1 - 2% activation rate, recovers 2 AP. Level 20 - 5% activation rate, recovers the lower of 20 AP or AP spent per battle. 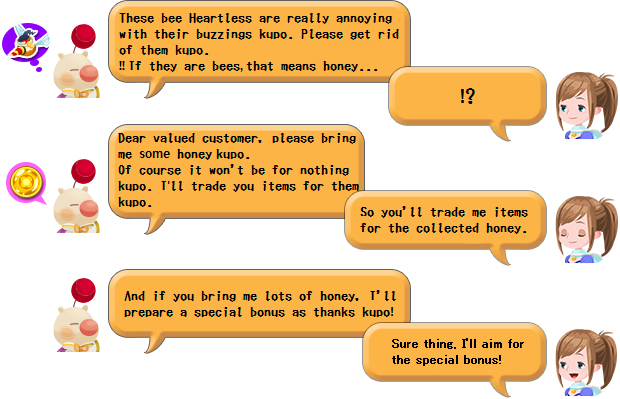 Honey event? And you thought Easter was silly. :wink: Thanks for the translation Kazr10. Indeed, thank you so much for all of your translations! Is the AP recovery skill new? I don't think I've seen it before..
AP Recovery isn't new, it was just premium only until now. I wouldn't worry about it, because it's a crappy skill anyway. Left with HP values and locations list. Can only do them tomorrow, gotta study. Those willing to help, please PM me thank you. Well location wise, don't know how you can tell their HP. Can we level up the "Honey bangle"? Or do we have boosters in this event? Or is the only way to increase the drop rate with those cards? Only option of boosting drop rate is to equip the event attack cards. No boosters as well thank god. I see, thank you (kinda hoped we would get High Potions for those boosters again). Ehehehe ~ and why's that? Honestly, I was never fond of bees. Gotta say though, the Fierce Queen Bee might be my most favorite Raid Boss so far. Just overtook the Gummi Hound. The Heartless designs are definitely one of [chi]'s greatest merits. It's strange that we got two event bosses at the same time though, normally just the subspecies would have been changed. And I was surprised when I saw both bosses dropping the honey-thing. It's the first time it happens,right? Anyway Shard can you find out the HP values? It's not showing up for me with your method. I hate bees because of The X-Files. I also just hate bees, because they are awful, but I mostly hate them because they once prevented my OTP from kissing. This has been a largely off-topic post. Strange, it worked for me: Nimble Bee - 3150 HP, Terrible Bee - 165337 HP. This has to be one of the easiest events to date, probably due to the cross promotion with Dragon Quest.